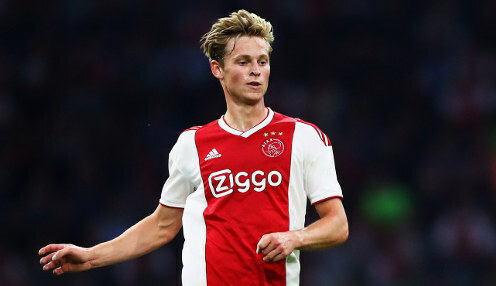 Ajax are confident that star midfielder Frenkie de Jong will recover from a slight hamstring strain to feature in the Champions League quarter-final second leg at Juventus. Having held the Italian giants to a 1-1 draw in the first leg in Amsterdam, Ajax will hope to repeat their heroics of the last round, when they thrashed holders Real Madrid 4-1 at the Bernabeu to progress in style. We will see, we are positive he can play. And head coach Erik ten Hag expects Barcelona-bound De Jong to be ready, despite having limped out of the weekend league game against Excelsior after just 22 minutes. He told reporters: "We will see, we are positive he can play. We took him off for prevention, we hope he can play, but we will see if it is possible." De Jong's agent, Ali Dursun, had earlier suggested that his client would be okay to feature in Turin, telling De Telegraaf: "Frenkie is fit. He will go to Turin and I think he will play. "He is positive. We were all worried on Saturday, but the substitution was only precautionary. The pain has never been strong, the shock was bigger than the injury." Ajax can be backed at 2.75 to reach the Champions League semi-finals and are 5.50 to win the game on Tuesday evening in normal time, with the Dutch outfit 23.00 to progress after extra-time. Meanwhile, Juve head coach Massimiliano Allegri is preparing his side for a huge occasion and he expects the visitors to play their preferred brand of attacking football. He added: "Our objective is to win the match and qualify for the semi-finals. I was convinced there would be goals in the first leg and I think the second leg will be very similar."